No matter how difficult the lives in these stories are, throughout the album there is always an undercurrent of hope. 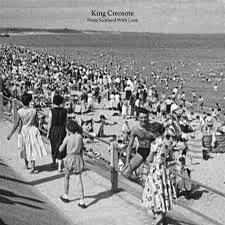 King Creosote (aka Kenny Anderson) uses his warbling tenor and pure falsetto to create melodies that range from raucous to enchanting. The Scottish folk icon collaborated with filmmaker Virginia Heath to create the soundtrack to a stirring film about Scotland using archive footage from the BBC. This is not the Scotland you may be familiar with: There are no queens in castles or warriors in kilts. Instead, regular people lead lives that are often desperate and struggling. Discordant songs about striking leftist trade unions alternate with an upbeat shanty about the beach and a toe-tapper about going out on the town after a week of hard labor. No matter how difficult the lives in these stories are, throughout the album there is always an undercurrent of hope. The line from the song "Miserable Strangers" seems to sum up the Scottish attitude of trying to make the best of difficult circumstances: "I was hoping that I might just get by… try to raise a hearty cheer."